If they ever gave out awards for the most memorable advertisements in motocross history, the man who came up with Yamaha's ad celebrating their success on the AMA circuit in 1978 would be in the running. 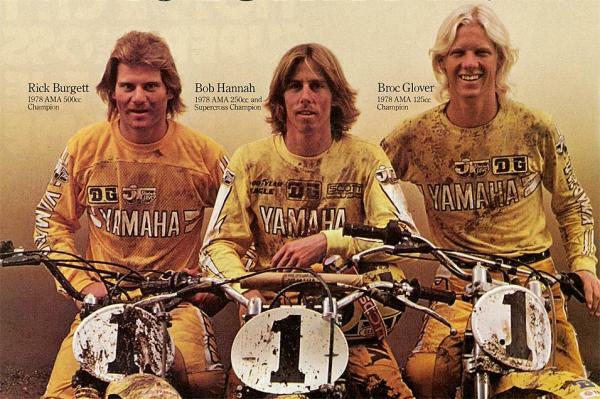 The striking advertisement featured 500cc National Champ Rick Burgett and 125cc National Champ Broc Glover flanking Bob Hannah—who not only won the 1978 AMA Supercross title but the 250cc AMA Motocross title as well—all dirty, sitting atop their then-yellow YZs, all wearing their #1 plates. This classic Yamaha ad pretty much said it all for 1978! Hannah and Yamaha started the '78 season slowly, losing the first three AMA Supercross rounds to a pair of very fast new Honda riders, Jimmy Ellis and Marty Tripes. But then Hannah caught fire and reeled off six wins in a row to gap the field and clinch the title early. It should be mentioned that three major stars all went down in one weekend at the Houston Astrodome, as Ellis separated his shoulder, defending 250cc #1 Tony DiStefano tore up his knee, and defending 500cc champ Marty Smith dislocated his hip—Tony D. and Smitty getting hurt in the same first-turn crash! Of the three, only Ellis would ever win another race, and that was the last 250 National of the series. 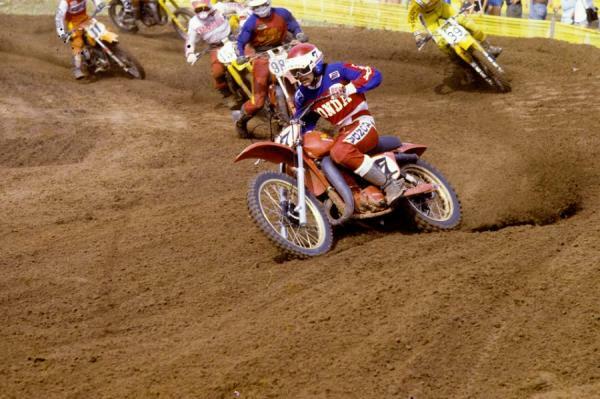 By that time, Hannah had so dominated the series—he swept the first eight races in a row—that he didn't even enter the last couple rounds of the series after injuring his wrist in an overlapping supercross. His streak to start the series would not be surpassed until a certain rider from Florida came along and started reeling off perfect seasons. 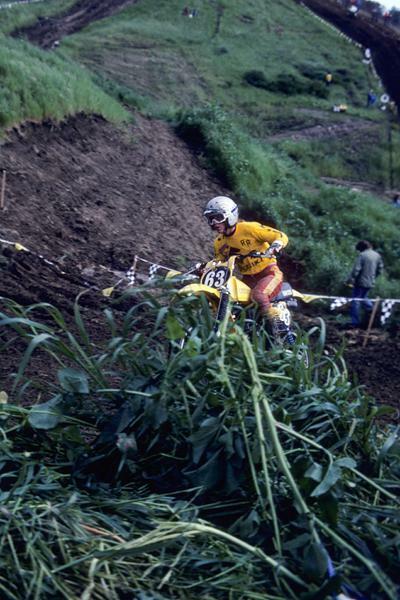 That's Suzuki-mounted privateer Danny “Magoo” Chandler at the '78 Escape Country National, just down the road from Saddleback Park. Hannah also won the Trans-AMA title that fall, becoming the first American to do so. He won four of the seven races of what would ultimately be the last Trans-AMA Series, as the AMA was sued by Pontiac, the company that made Trans-Am cars, for copyright infringement. One year later the fading series would be called the “Trans-USA” tour. Hannah had been forced to ride the 125 class the previous year and did not like it one bit, but his teammate Broc Glover won the title anyway, so it was little surprise to anyone that the “Golden Boy” from El Cajon won his second straight title in the class, outpacing the veteran Kawasaki rider Gaylon Mosier (who won a round on a Kawasaki) and Suzuki's hotshot prospect Brian Myerscough. But deeper in the field were a couple of newcomers who would soon shake things up in American motocross: seventh-ranked Jeff Ward and ninth-ranked Mark Barnett. 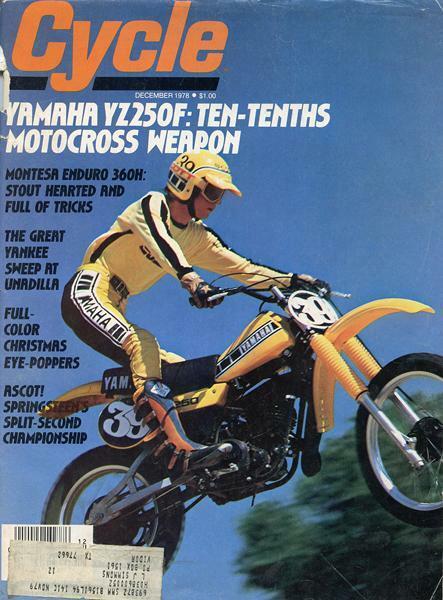 Mike Bell was the youngest member of Team Yamaha, waiting in the wings but on the cover of Cycle magazine in December '78. Yamaha started slowly in the 500cc Nationals as well, as Suzuki's Danny LaPorte and Honda's Tommy Croft captured the opening rounds at Lake Whitney, Texas, and Sonoma, California, respectively. But then everything turned yellow as Rick Burgett, Rex Staten, and the young Mike “Too Tall” Bell split the last eight wins of the ten-race tour. “The Lumberjack” Burgett won the most, as well as the title, then found himself in that famous ad with Hannah and Glover. Honda's Tommy Croft leads the 500cc pack at Lake Whitney in Texas. Let's go back to the famous Yamaha ad for a second. Racer X's own Eric Johnson started out in advertising, and he once told us about having that ad hang on his bedroom wall as a kid growing up in Ohio. Once he got into the business, he dug a little deeper into how the famous ad came about. “The ad was produced in the fall of 1978,” explains EJ. “Chiat/Day was still a very young agency at that point, but the word on the streets of American advertising was that the shop was going to change the way America looked at advertising. Leading the charge was the creative director, Lee Clow. Lee dug motorcycles and what they stood for. The ad was Lee's idea and featured Bob, Broc and Rick Burgett and the #1 plates the earned in the '78 AMA championships. I was a teenager when that ad came out, but it just blew me away.